Nob hill is one of San Francisco's attractions, renowned for its city landmarks and the famous hotels that border Huntington Park. 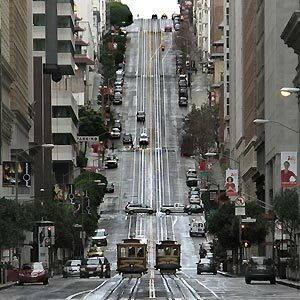 The hill boasts one of the best views of San Francisco Bay, especially when observed from a California Street Cable car. Nob Hill, located on the top of California Street has been home to San Francisco's early millionaires - Gold Rush and railroad nabobs. The mansions built by them are now some of the city's finest hotels - The Fairmont, the Huntington and the Mark Hopkins. Apart from the grand hotels, you can find Grace Cathedral - a replica of Notre Dame in Paris. The Grace Cathedral has doors that are replicas of Ghiberti's 'Gates of Paradise'. The restored stained glass windows are also worth a viewing. Look for Huntington Park on Nob Hill - venue for many arts shows and where you can see the replica of a 16th century Roman fountain. The famous Lombard street (crooked street) with its series of hairpin bends was built in the 1920s to accommodate the steep incline. Earlier, Nob hill was home to kings who build their mansions there, far above the bawdy waterfront. Nob hill in San Francisco has historical cascades, luxury apartments, small Chinese temples, funky shops, dive bars and business centers. You can find vintage barbershops, old corner coffee shops and cocktail lounges that date back to a bygone era. Nob hill has been home to Herb Caen, the Legendary Columnist and Marian and Vivian Brown, the famous San Francisco twins known for their signature identical outfits. The Nob Hill Masonic Center is an architectural wonder that hosts many a musical event. Performances by Tony Bernett, Stevie Nicks and Geoge Carlin and John Edward have been held here. The excellent acoustics and intimate auditorium lend the Nob Hill Masonic Center a charming ambience that makes it a popular venue for corporate events, product launches, banquets and weddings.